Do you have a caring heart and a compassionate drive to bring a smile to someone's face during a difficult time in their life? Our hospice patients are in need of individuals who have the desire to give a little bit of their time to provide companionship and friendship to those who are alone and in need of a friend. 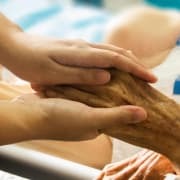 Often times when an individual is given a terminal diagnosis, friends and families may not come to visit out of fear of knowing what to say or how to act out of discomfort for the patient. Many times patients are alone and afraid and in need of someone who can provide a loving hand and caring heart to bring joy in their lives.